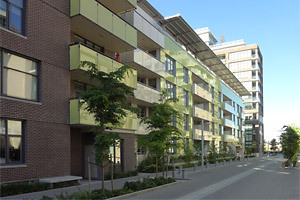 First Avenue Athletes Village Housing Co-op is location in the 2010 Olympic Village in Southeast False Creek near downtown Vancouver. For more information on stores and amenities see the Olympic Village page on the City of Vancouver web site. The Village is just steps away from the Main Street/Science World Skytrain Station and city buses at the intersection of Main and Terminal. It is also close to the Olympic Village Canada Line station with service to the Vancouver International Airport, and very close to Aquabus service at Science World. The Vancouver Pacific train and bus stations are only blocks away on Station Street. The Village is in the Vancouver School Board catchment area for Simon Fraser Elementary School and Eric Hamber Secondary School. There is a daycare in the neighbourhood Creekside community centre. There are two small non-profit day-cares within the building that are managed independently from the housing co-op. The neighbourhood is located on the beautiful False Creek waterfront that leads to walking and cycling paths around the entire seawall from Kitsilano Beach to Stanley Park. Hinge Park is steps away and Creekside Park is a short walk.